REMEMBERING GALLIPOLI | The International Cricket Hall of Fame. Born on the 11th April 1884 in Adelaide Australia, Charles Backman is noted as being a right-hand bat and right-arm medium bowler. Besides playing one first class match for South Australia he was a Boilermakers Assistant with the South Australian Railways. During the 1911-12 Sheffield Shield season in his one game with South Australia he made 16 runs and took 3/53 with the ball. When war broke on 28th July 1914 out he enlisted in the AIF on 19th August and was assigned to the 10th Infantry Battalion as a sergeant. In October he left Australia’s shores for Egypt where he arrived in December and conducted further training. He was then deployed to the front where he was among the first soldiers to lay down their life in the Gallipoli campaign with his Battalion, as part of the 3rd Brigade the first to go ashore at approximately 4:30am on 25th April 1915. The Red Cross report of wounded and missing soldier’s states that Backman was wounded in the initial advance of the Dardanelles landing and it is thought he then crawled away into nearby bushes. Three days later a roll-call was finally undertaken for the 10th Battalion when Backman was reported as wounded and missing. In June, after reports from his fellow soldiers were logged his status was changed from missing to killed. In July his mother was notified of his death. While it is believed his ID tag was recovered his body was never found. 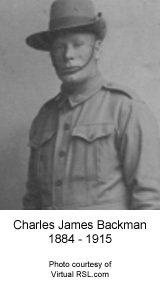 Sargent Backman was only 31 years of died when he died on the first day of the Gallipoli campaign. He has no marked grave though his name is listed on the Lone Pine Memorial at Gallipoli. In September 1915 he was made a life member of the Adelaide District Cricket Club.